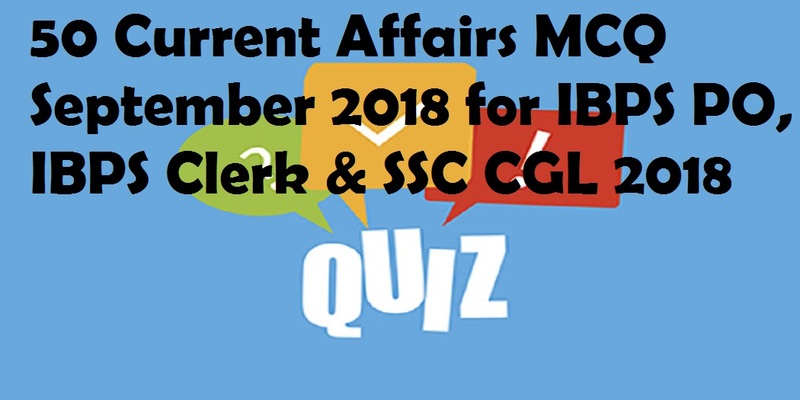 Dear Students, We are sharing 50 Current Affairs MCQ Online Quiz of September 2018. 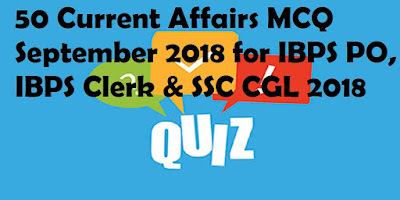 All important Current Affairs Quiz Questions have been given which will boost your GK Preparation. Question 01. Total gross GST revenue collected in August 2018 is ________? Total gross GST revenue collected in August 2018 is Rs.93,960 crore of which CGST is Rs.15,303 crore, SGST is Rs.21,154 crore, IGST is Rs. 49,876 crore (including Rs. 26,512 crores collected on imports) & Cess is Rs. 7,628 crore (including Rs. 849 crores collected on imports). Question 02. Who has been appointed as the Chairman and Managing Director of Hindustan Aeronautics Limited (HAL)? India's aerospace giant Hindustan Aeronautics Limited (HAL) appointed R Madhavan as its Chairman and Managing Director for five years. The 56-year-old replaced T. Suvarna Raju. Question 03. Who won gold medal in Men's 49 kg Boxing final in Asian Games 2018? In Asian Games 2018, India's Amit Panghal wins gold medal in Men's 49 kg Boxing final. Question 04. Filing of Income Tax Returns registers an upsurge of _____________ up to 31st August, 2018.? Filing of Income Tax Returns registers an upsurge of 71% up to 31st August, 2018. The total number of ITRs e-filed up to 31st Aug was 5.42 crore as against 3.17 crore upto 31 Aug 2017. Question 05. Who has announced his retirement from international cricket? Former England skipper and opener Alastair Cook has announced his retirement from international cricket. Question 06. India and _______ have signed Memorandum of Understanding (MoU on 'Combating Money Laundering and Cooperation' in the field of Environment? India and Cyprus have signed two Memorandum of Understanding (MoU on 'Combating Money Laundering and Cooperation' in the field of Environment, in presence of the Presidents of both the countries. Question 07.The 47th Director General Level Co-ordination meeting between Border Security Force (BSF) and Border Guard Bangladesh (BGB) held in _____________? The 47th Director General Level Co-ordination meeting between Border Security Force (BSF) and Border Guard Bangladesh (BGB) started in New Delhi. It will held from 3rd September 2018 to 7th September 2018. Question 08. India-United States 2+2 Dialogue was held in _____________? India-United States 2+2 Dialogue will be held in New Delhi. Counter-terrorism, defence cooperation, trade to be discussed in this inaugural Dialogue. Question 09. Which Government to distribute mobile phones to women under the Bhamashah Yojana? Question 10. Who has been elected as the new chairman of the Pakistan Cricket Board? Former ICC president Ehsan Mani has been elected unopposed as the new chairman of the Pakistan Cricket Board. Question 11.Who has been elected as the 13th President of Pakistan? PTI candidate Arif-ur-Rehman Alvi was elected as the 13th President of Pakistan. Question 12. India and ____________ signed the Communications Compatibility and Security Agreement (COMCASA)? India and the US signed the Communications Compatibility and Security Agreement (COMCASA) that enables India access advanced US defence systems. Question 13. The supreme court of India scrapped _________ of the Indian penal code that criminalised homosexuality? The supreme court of India today (Sept. 06) scrapped section 377 of the Indian penal code that criminalised homosexuality. Question 14. Who won a gold medal in Men's 10m Air Pistol finals at 52nd ISSF World Championship? India's Saurabh Chaudhary wins a gold medal and Arjun Singh Cheema wins a bronze medal in Men's 10m Air Pistol finals at 52nd ISSF World Championship. Question 15. The first-ever BIMSTEC (Bay of Bengal Initiative for Multi-Sectoral Technical and Economic Cooperation) military anti-terror exercise slated was held in ________? The first-ever BIMSTEC (Bay of Bengal Initiative for Multi-Sectoral Technical and Economic Cooperation) military anti-terror exercise slated to be held in Maharashtra's Pune between September 10 to September 16. Question 16.Aero India 2019 to be held in which City? Aero India 2019 to be held in Karnataka's Bengaluru from 20-24 February 2019. The five-day event will combine a trade exhibition for the aerospace and defence industries with public air shows. Question 17. The Hockey World Cup is scheduled to be held in which of the following state? The Hockey World Cup is scheduled to be held in Odisha in November this year. Question 18. Which government launched 'Doorstep Delivery of Public Services' for the people living in the national capital? Delhi government launched 'Doorstep Delivery of Public Services' for the people living in the national capital, earlier today. Delhi CM Arvind Kejriwal, Deputy CM Manish Sisodia and other ministers were present at the occasion. Question 19. Which Indian district has been declared open defecation free? Udhampur district has been declared open defecation free. Udhampur Deputy Commissioner say '75,000 toilets have been constructed in the district & the people themselves have built them. Question 20. Who has been appointed as the next Chief Justice of India? Question 21. American Filmmakers Rob Epstein and Jeffrey Friedman are collaborating with _______________ to develop the LGBTQ documentary 'State Of Pride'. Question 22. Who has launched the ‘Swachhata Hi Seva’ Movement, to boost nationwide public participation in the Swachh Bharat Abhiyan, and catalyse the fulfilment of Bapu’s dream of a Clean India? The Prime Minister, Narendra Modi, launched the ‘Swachhata Hi Seva’ Movement, to boost nationwide public participation in the Swachh Bharat Abhiyan, and catalyse the fulfilment of Bapu’s dream of a Clean India. Question 23. India and _________________ signed agreements on cooperation in plant protection and plant quarantine and on-air services? India and Serbia signed agreements on cooperation in plant protection and plant quarantine and on-air services, following the talks between Vice President Venkaiah Naidu and Serbian President Aleksandar Vucic. Question 24. The International Day of Democracy is observed globally on which of the following day? The International Day of Democracy is observed globally on 15th September. It provides an opportunity to review the state of democracy in the world. The theme for IDD is 'Democracy under Strain: Solutions for a Changing World'. Question 25. Which Indian Hockey Player Announces Retirement from international hockey? Former Indian Hockey Captain Sardar Singh Announces Retirement from international hockey. He made the decision after a disappointing Asian Games where India failed to defend their title and had to settle for a Bronze medal. Question 26. Who wins best drama series at The Emmys? Game of Thrones wins best drama series at The #Emmys. Question 27. Which of the following banks to merge? Government have decided to merge Dena Bank, Vijaya Bank and Bank of Baroda. Merger of the 3 banks will make this the third largest bank of the country. Question 28. India's first exclusive dog park has been set up in ________________? India's first exclusive dog park has been set up in Hyderabad and will be inaugurated soon. The park offers training & exercise spaces for dogs, splash pools, an amphitheater among others. The park has been certified by The Kennel Club of India. Question 29.Meredith Corp. is selling Time magazine to Marc Benioff, co-founder of Salesforce, for _____________ USD in cash? Meredith Corp. is selling Time magazine to Marc Benioff, co-founder of Salesforce, for 190 million USD in cash. Question 30. Joint India-US military training exercise was held in _____________? Question 31. Ministry of Home Affairs and _____________ have signed a MoU for setting up of an Integrated Control Room for Emergency Response (ICR-ER) in Ministry of Home Affairs? Ministry of Home Affairs and Indian Space Research Organization (ISRO), Department of Space have signed a MoU for setting up of an Integrated Control Room for Emergency Response (ICR-ER) in Ministry of Home Affairs. It'll help in disaster management & internal security. Question 32. Tran Dai Quang has died at age 61 due to illness, He was the President of which of the following Country? Vietnamese President Tran Dai Quang has died at age 61 due to illness. Question 33. Which film has announced as the official Oscar entry from India this year by Film Federation of India? Film Federation of India announces Assamese film 'VillageRockstars' as the official Oscar entry from India this year. Question 34. Which American golfer wins Tour Championship for 80th PGA Tour title? American golfer Tiger Woods wins Tour Championship for 80th PGA Tour title. Question 35. Who has been awarded by Rajiv Gandhi Khel Ratna Award? Indian skipper Virat Kohli receives Rajiv Gandhi Khel Ratna Award from President Ram Nath Kovind at Rashtrapati Bhavan in Delhi. Question 36. Who wins FIFA award for best men's coach of the year? Question 37. Who wins FIFA men's player of the year? Question 38. Who among the following has not been awarded by Arjuna Award? All (a), (b) and (c) recieved. Table Tennis player Manika Batra and Javelin Thrower Neeraj Chopra receive Arjuna Award from President Ram Nath Kovind at Rashtrapati Bhavan. Sprinter Hima Das receives Arjuna Award from President Ram Nath Kovind at Rashtrapati Bhavan in Delhi. Question 39.Telecom Commission has been renamed as ___________? Question 40. Union Cabinet approves financial assistance worth ______________ for relining of Sirhind Feeder Canal(Punjab) and Rajasthan Feeder Canal? Union Cabinet approves financial assistance worth Rs 825 Crore for relining of Sirhind Feeder Canal(Punjab) and Rajasthan Feeder Canal. Question 41. After New Order of Supreme Court, Aadhaar Card is Mandatory for which of the following? Supreme Court has ordered that Aadhaar mandatory for PAN linking; not compulsory for UGC, NEET & CBSE exams & school admissions. Aadhaar not needed for opening a bank a/c, no mobile company can demand Aadhaar, private companies can't seek Aadhaar data. Question 42. The Selection Committee of the Ministry of Personnel appoints __________ as Chairperson of the Search Committee for the the purpose of recommending the panel for consideration of the positions of Chairperson & Members of Lokpal? The Selection Committee of the Ministry of Personnel appoints Justice Ranjana Prakash Desai as Chairperson and 8 others as Members of the Search Committee for the the purpose of recommending the panel for consideration of the positions of Chairperson & Members of Lokpal. Question 43. IPS officer __________ to take charge as new Director General of Border Security Force (BSF)? Question 44. IPS officer ____________ appointed as Director General of Sashastra Seema Bal (SSB). IPS officer SS Deswal appointed as Director General of Sashastra Seema Bal (SSB). Question 45. Which country will host UEFA 2024: Union of European Football Associations(UEFA)? Question 46. Indian Administrative Officer ________ has been appointed as the new Chief Secretary of Himachal Pradesh? Indian Administrative Officer B.K Aggarwal has been appointed as the new Chief Secretary of Himachal Pradesh. Question 47. What is the Name of the New Born District of Madhya Pradesh? Madhya Pradesh govt today(28.09.2018) announced creation of a new district 'Niwari'. It takes the number of districts in the state to 52. The new district would include three tehsils of the present Tikamgarh district- Niwari, Orchha & Prithvipur. The decision will come into effect from Oct 1. Question 48. Who won Asia Cup 2018? India defeated Bangladesh by three wickets in a nail-biting last ball encounter to bag the Asia Cup title at the Dubai International Stadium. Question 49. Japan International Cooperation Agency (JICA) signed an agreement with Govt of India to provide an Official Development Assistance (ODA) loan of ________________ Japanese Yen (approx. INR 5,500 Crore) as Tranche 1 on the ‘Project for the Mumbai-Ahmedabad High-Speed Rail (MAHSR)’? Japan International Cooperation Agency (JICA) signed an agreement with Govt of India to provide an Official Development Assistance (ODA) loan of 89,547 million Japanese Yen (approx. INR 5,500 Crore) as Tranche 1 on the ‘Project for the Mumbai-Ahmedabad High-Speed Rail (MAHSR)’. Question 50. Who has been appointed as the next Ambassador of lndia to the People’s Republic of China? Vikram Misri, presently Ambassador of India to Myanmar has been appointed as the next Ambassador of lndia to the People’s Republic of China.